Living in a city nicknamed the “little red dot”, most homeowners are already dealing with limited square footage to create their dream spaces. However, these seven spaces are even smaller than what we’re used to, yet big enough to make design dreams a reality. 1. Retractable furniture and visual tricks make this small unit not only stylish, but functional. The floor-to-ceiling mirror in the living room creates the illusion of space while the retractable table at the kitchen island hides away when the homeowners are done with their meals. Glossy white cabinets reflect the light streaming in from the windows, keeping it light and airy. A darker textured rug grounds the space and provides visual interest. 2. High ceilings and stylish storage solutions in this project give the homeowner plenty of spaces to store knick-knacks, with an integrated TV console and writing desk. The wall of storage extends into the kitchen, integrating the two zones. 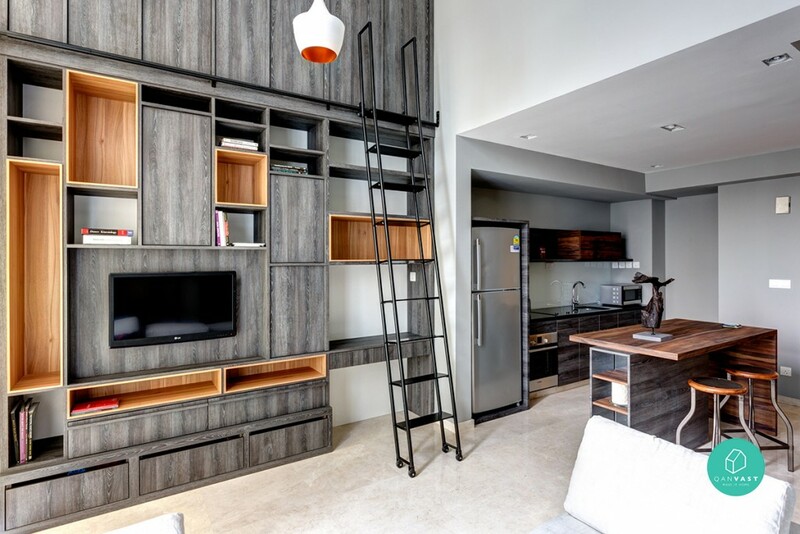 The masculine dark wood grain is alleviated by lighter wood tones to keep it balanced, while the rolling library ladder provides a focal point that draws the eyes upward, and keeps higher storage units accessible. 3. 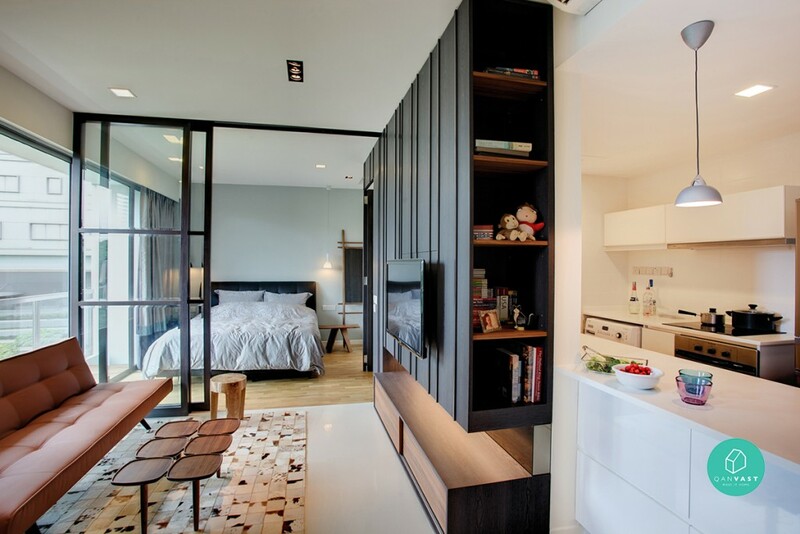 An industrial glass and metal divider demarcates sleeping and living zones in this unit to create privacy while maintaining a sense of openness. Black and white tones are grounded by rugs in each zone, while the faux-brick provides texture on the stark white walls. A modern couch, wrapped in neutral fabrics and elevated by slim metal legs, keeps floor space free while providing a place to lounge. 4. 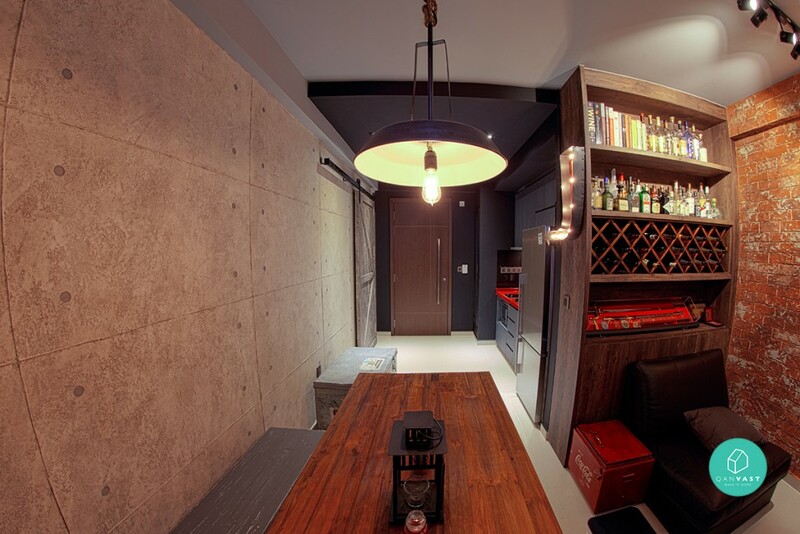 This unit uses industrial accents and intelligent touches to create a functional small space with a ton of personality. Military style storage boxes double up as seating for the dining area, while a vintage pendant with Edison bulbs provide illumination. 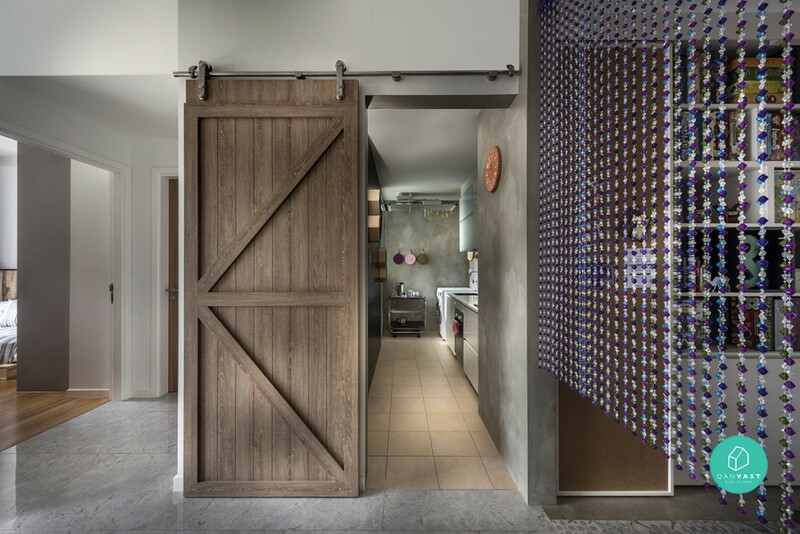 The barn style sliding door keeps floor space free but gives the room a sense of drama. 5. 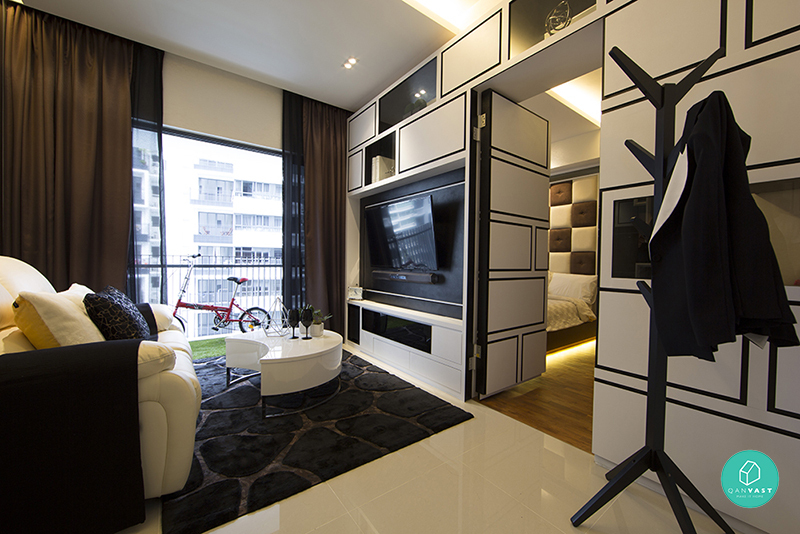 Using a feature wall that integrates the bedroom wardrobe and television display gives this apartment a sense of flow. Smart furniture choices like a coffee table with tapered legs take up less visual weight while being on trend. The white kitchen is clean and modern while the schoolhouse-style pendant lamp draws the eye upward and gives the space some personality. 6. Clever engineering keeps this apartment functional and beautiful. The TV swings between the bedroom and the living room, allowing the homeowner to watch programmes in both rooms without buying a second television. The feature wall design also integrates the bedroom door and provides a strong graphic element that hints at classic wall panels. Mahogany toned curtains and floor rugs lend it a moody, masculine vibe. 7. The use of different flooring is used to denote spaces and functions in this tiny apartment. Regular ceramic tiles highlight the kitchen area, where concrete stamped walls and a sliding barn door hint at an industrial vibe. Marble-look tile flooring is used for the common walkways and wood strip flooring is used to demarcate sleeping areas. Perankan tiles and a bead curtain are an interesting juxtaposition in the study area. Whether your home is big or small, keep these design inspirations in mind when creating your dream nest. If you need more ideas to spruce up your place, download the Qanvast app and you can save thousands of cool home renovation ideas onto your Qanvast boards for future reference. This entry was posted in Renovation and tagged 0932 Design Consultants, Ah Hood Road, Canberra, Green Haven Show Suite, Juz Interior, Lengkong Court, NV Residence, One-North, Parc Emily, Project File, Prozfile, Renovation, small spaces, Space Define, Thom Signature Design. Bookmark the permalink.